Senior Surgeon Colin Driver in consultation with a client at Fitzpatrick Referrals. Fitzpatrick Referrals is committed to delivering the service that you, our partners in care, need. We have reduced waiting times for consultations at our Eashing practice. With the addition of three orthopaedic surgeons to our team, we are now seeing routine orthopaedic cases including TPLO, Arthroscopy and Patellar Luxation within 1 week. 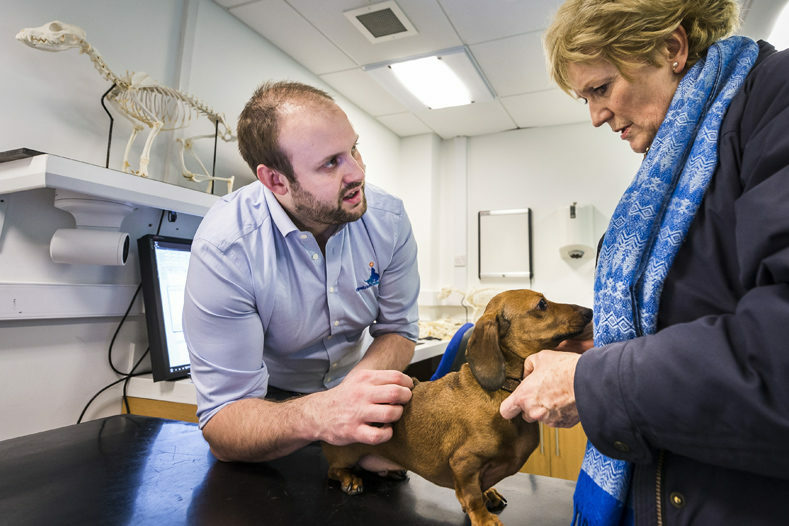 Highly specialised referrals, including those to Professor Noel Fitzpatrick, should expect to wait longer for an appointment. As always all of our costs are highly competitive and we strive to ensure we always deliver genuine value to our clients. We believe that your clients should not be unfairly penalised for choosing Fitzpatrick Referrals, so we will cover the additional excess levied by companies in the RSA Insurance Group***. Same day emergency appointments are available 24/7 for all services. *Appointment waiting times are subject to change. Routine orthopaedic referrals from local practices that are likely to require surgery are typically seen within 1 week; routine spinal surgery referrals within 24 hours. **Advice within 1 hour applies to normal working hours (8am – 8pm) Monday to Friday – out of hours we can give advice for emergency cases. ***See Fitzpatrick Referrals RSA Insurance Group policy.